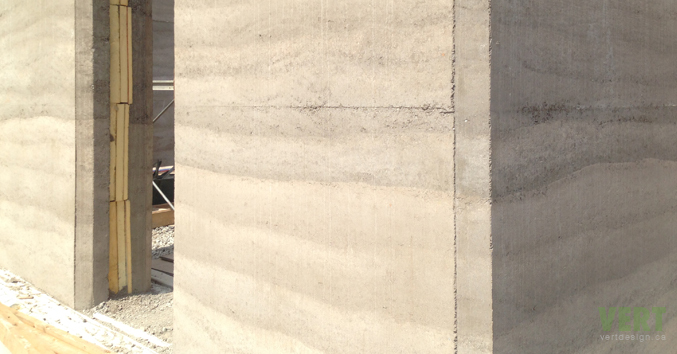 Building with cement stabilized, reinforced, insulated rammed earth (CSRIRE) is an alternative solution to other mass wall systems currently accepted in the Ontario Building Code (OBC 2012), namely reinforced masonry. CSRIRE wall systems have many benefits, including; potential for passive heating and cooling due to the large thermal mass, low maintenance and operating costs through the elimination of additional exterior and interior finishes, low toxicity in the materials used in construction, high thermal resistance throughout the building envelope, and a longevity equaled by few other building materials. While the use of Portland cement as a stabilizing agent means the wall system has a higher embodied energy than traditional, un-stabilized rammed earth, the structural and durability benefits it bestows go towards offsetting that energy consumption over the lifetime of the building. CSRIRE is used in a wall construction technique whereby a blend of clay, silt, sand and aggregate (earth) are mixed together with 8 to 10% Portland cement and 11 to 13% water amended with a silicate emulsion to reduce permeability and efflorescence. Both the Portland cement and water contents are determined by weight. The mix is placed into a formwork cavity with centered rigid insulation and is mechanically compacted to form inner and outer wythes of rammed earth on each side of the insulation. It is important that no organic material is present in the blend and the particle size distribution is evenly graded. This conglomerate of materials is stabilized (i.e. to limit water absorption, stabilize volume, and to increase durability and strength) through both chemical and mechanical means. 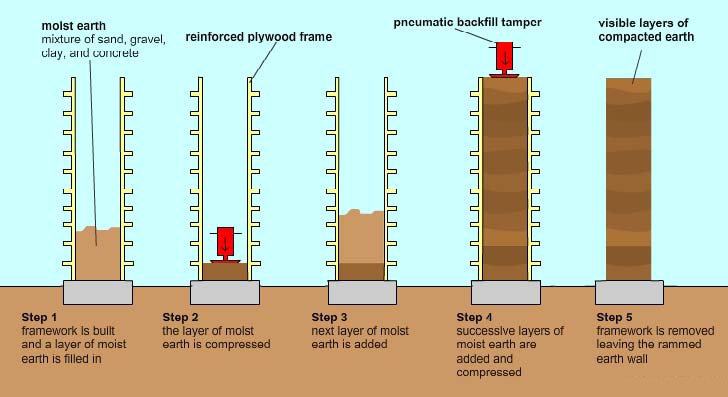 Chemical stabilization is achieved by the hydration of Portland cement in the soil blend while mechanical stabilization occurs through a process of pneumatically compacting the mixture in discrete lifts of an average 6” compacted height. The compaction is carried out using a pneumatic tamper with a circular flat end ‘shoe’, usually of 3” diameter. Reinforcing materials such as steel CAN/CSA G30.18 conforming billet steel bars are incorporated vertically and horizontally in each wythe and CSA G30.5 conforming welded steel wire fabric is used to connect the wythes through the insulation layer. The design of the soil blend as well as the percentage of cement used is critical in determining the resulting strength of the wall. The appropriate soil mixture and cement percentage is determined on a project-by-project basis through a pre-construction testing program conforming to CSA S304.1, Design of Masonry Structures. The walls can be constructed in various thicknesses and configurations. The inner and outer wythes are typically a minimum of 6” thick. The core of insulation has historically been 4” when constructed on the Canadian west coast, however with our more extreme temperature variations 6” of rigid insulation (polyisocyanurate or extruded polystyrene) is recommended in Ontario. Any services, such as electrical or plumbing chases that may be required, are run through conduit that is embedded within the inner wythe. The configuration proposed for the Smyth-Allcott residence at 3685 Donnelly Drive, Kemptville, consists of a structural inner wythe of 7” width, a 6” rigid insulation core and a 7” exterior veneer wythe. Once the mechanical stabilization has been completed and the formwork removed, the wall requires no further finishing. 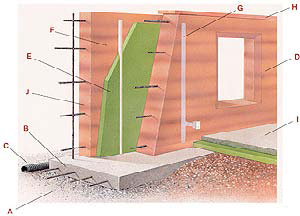 Below is an example of a typical non-insulated rammed earth wall construction sequence.